In 1933, Nazis burned 2,000 books they found "subversive." 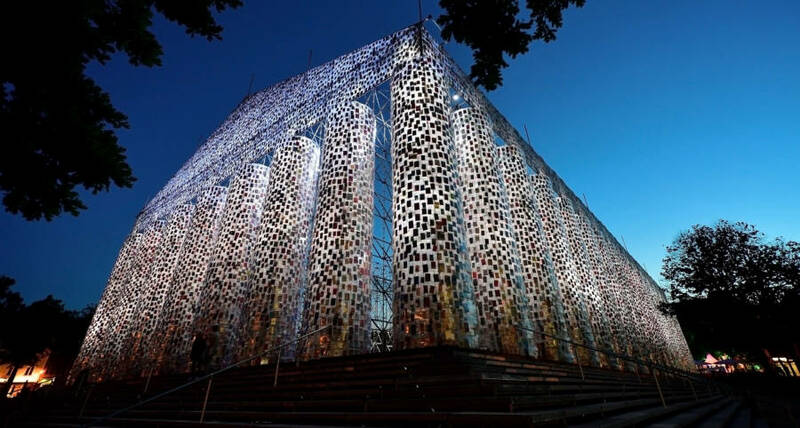 A conceptual artist has just built a Parthenon of banned books where the burning took place. Thomas Lohnes/Getty ImagesThe artwork ‘The Parthenon of Books’ with donated books by the artist Marta Minujin is illuminated at night on June 8, 2017 in Kassel, Germany. The Greeks made their Parthenon with marble. Artist Marta Minujín has made hers with banned books. Minujín, whose full-scale replica of the architectural ode to democratic ideals is now on display at the Documenta 14 art festival, didn’t just erect that 45-foot-tall structure anywhere. Rather, she chose to build it in the town of Kassel, Germany — and more specifically a plaza called Friedrichsplatz. It was there that, in 1933, members of the Nazi Party burned approximately 2,000 books. This event composed part of a larger Nazi undertaking called the “Campaign Against the Un-German Spirit,” in which the Nazis attempted to do away with any artistic works — but especially books — they saw as “un-German” or having corruptive Jewish or “decadent” qualities. During this campaign, the Nazis burned thousands of works of literature that they deemed degenerate or subversive. In order to construct her Parthenon — which she has worked on since October 2016 — This Is Colossal reports that the artist worked with students from Kassel University in order to identify and solicit over 170 books — such as Ray Bradbury’s Fahrenheit 451 and George Orwell’s 1984 — that have been systematically censored for public consumption. Soon enough, people across the globe sent Minujín 100,000 copies of these chosen books for her use. But before Minujín could add the books to her structure, she first constructed a steel skeleton. The artist proceeded to “strap” the books to the frame, and then covered each part of the monument in plastic sheeting to protect it from the elements. If you can believe it, this is not the first Parthenon of banned books that Minujín has built. In 1983, immediately following the fall of the military junta in Argentina, Minujín constructed a scale model of the Parthenon built out of 25,000 books that had been banned under military rule. She called this monument “El Partenón de libros” and placed it Buenos Aires for public view. At the time, she described it as an attempt to signal a new era of democracy and free thought in the nation. Verbotene Bücher gucken #kunstüberall #unddasmitkater #undmitfraukröger #inkassel #documenta14 #parthenonofbooks @julikakr ???? Next, read about the many works of art that are, or have been banned in the United States. Then, check out the picture of himself that Hitler had banned in Nazi Germany.